It's pretty commonplace these days to find venues and breweries getting together to brew beers. It wasn't so in 2012, back when the innovators at Bridge Road launched the Bar Series to do just that. 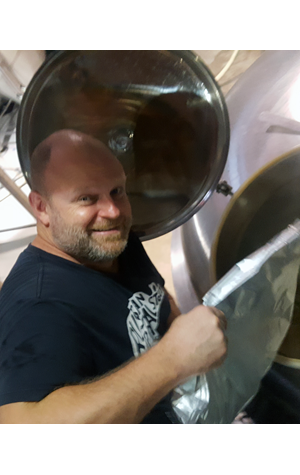 Five years on, they're at it again, with the first venue to join them at the brewery being Brisbane's Brewski. Head brewer Ben Kraus and bar owner Matt Emmerson (pictured on brew day) wanted to make a beer that has something of the bar's home state in and decided on a saison featuring finger limes from the Granite Belt. Yet the beer is called Steamy Fingers, not Yeasty Fingers, because they couldn't get hold of any pitch-able saison yeast in time for the beer's launch at Brewsvegas. So it became a steam ale in which the finger limes would do the work usually carried out by hops. Says Ben: "We were impressed with the intense flavour you get from one tiny finger lime sac and that it’s native to Australia." The beer has been launched at Brewski, where you can join The Crafty Pint and Ben Kraus for beers at 3.30pm on March 17 as part of our Pint of Origin tour of Brewsvegas, and will hit other Bar Series venues too.